Here are some important guidelines and points to follow previous, during and after our service is done. Remove all loose items from the room like rugs, toiletries, wall decorations, curtains, etc. Partial or complete clogged sewage pipes must be fixed first. If the water backs up and comes out of the drain it can ruin the fresh reglazing coat of during or after the job is done. 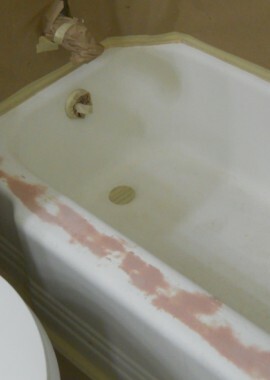 Please make sure there are no leaks on the surface to be refinished. If there are, please get them repaired before the scheduled refinishing service. Water leaks may ruin the freshly reglazed surface. In order to reduce the chance of anything landing in the fresh coat of glaze, clean the surrounding area and ceilings one or two days before our arrival, not on the day of the job, nor during the first 48-hours of the new reglazing curing time. Also avoid doing extensive work in adjacent areas that produce dust particles which later may fall into the tub while the new finish is drying. Customer is responsible for the cost to repair damage caused by any foreign object or dust that lands on the refinished surface after the job has been completed. We suggest not scheduling other types of repair work for the day of the reglazing service. The cutting of wood, the handling of mosaic, carpet, or general cleaning can produce lint that could be trapped within the layers of the glaze. This will create bumps or scratchy areas on the surface of the tub and cause discomfort when making contact with the skin while bathing. 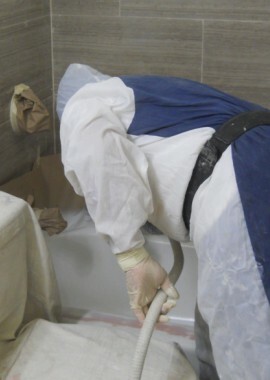 We must mask the bathroom walls and furniture to prevent overspray. Sometimes the paint under the masking tape peels off. Wall peeling is not caused by the tape itself, but because the wall was not thoroughly prepared before painting. Also, the bathroom can retain moisture which weakens the adhesion of the paint to the wall. Therefore, we advise you to make sure that before painting, the wall is sanded, primed, and a good quality paint is going to be used. IT IS IMPORTANT THAT THE REGLAZE BE ALLOWED 48 HOURS TO CURE. Do not set and leave anything (wet towels, soap, bottles, etc.) on the reglazed surface including water for 48 hours as it may soften the glaze. A full cure takes about 6 days so it is best not to leave any shampoo bottles or other items on the tub for at least 6 days. We cannot prevent dust from settling onto the newly refinished surface, as we are not working in a 100% dust free environment. Sometimes dust, fluff, lint or even small bugs (flies, butterflies, etc) might get stuck on the freshly refinished surface. DO NOT PICK OR TRY TO REMOVE PARTICLES AS THIS MAY DAMAGE THE SURFACE. Most of the time the lint or fluff can disappear during the first 2-3 weeks when the tub is washed. Caring for a newly refinished surface is similar to taking care of brand new surfaces. Everything that damages a brand new fixture can damage a newly refinished fixture as well. 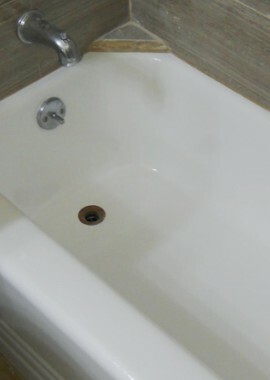 One of the advantages of having your bathtub reglazed is that it the new non-porous surface is easier to clean. Regular cleaning is important to prevent dirt, hard water stains and soap scum build-up that will hide the beauty of the finish. To clean, use non-scratch scrub sponges with warm water, liquid detergents or non-abrasive bathroom liquid cleaners. Here are some commercial products that will clean the refinished fixture without dulling the finish: Stay Clean sponges by Scotch Brite, Dow Scrubbing Bubbles, Lysol Tub and Tile Cleaner, 409, Lime Away Bathroom/Kitchen Cleaner, Mr. Clean, diluted white vinegar and all purpose liquid dish soaps such as Joy, Ivory or Dawn.